I am proud to be among featured artists at Afropop Worldwide’s 30th Anniversary and Gala on May 3 at City Winery NYC. The event will feature performances by two new Afropop Hall of Fame honorees: Garifuna global ambassador Aurelio Martinez, and Zimbabwe’s international sensation, Mokoomba..
Afropop’s mission is to reveal the essential music and stories of Africa and the African diaspora, celebrating the roots of the world’s greatest pop music traditions. In the early 20th century, there were around 3-5 million African elephants. Today, there are approximately 415,000. My T-shirts, paintings and greetings cards advocate support for and raises awareness about a broad range of causes including poverty, empowering women and girls, youth education, wildlife preservation, arts and culture. About Afropop: Afropop Worldwide is a Peabody award-winning radio program and online magazine dedicated to music from Africa and the African diaspora. Hosted by one of Africa’s best-loved broadcast personalities, Georges Collinet, and produced by Sean Barlow, the radio show is currently distributed by PRI Public Radio International to over 100 stations in the U.S., as well as stations in Europe and Africa. 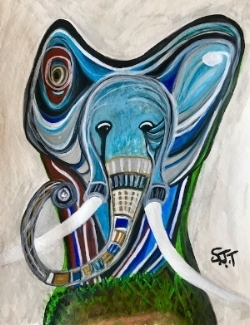 By Sam Taylor, President of Reputation Dynamics and Founder of Elephant Art Shop. I am excited to be participating on a panel at Columbia University’s Annual African Economic Forum. My remarks will primarily focus on the importance of private-public partnerships and approaches to address youth unemployment, mitigate poverty and create a path to economic prosperity. Youth Unemployment: Youth unemployment is one of Africa’s greatest challenges. Unemployment among young people aged 15–24 years old in sub-Saharan Africa has hovered between 12% and 14% since the 2008 global financial crisis. The data does not include youth in vulnerable employment and underemployed in informal sectors, who make up at least 70% of the workforce. Although these statistics may seem daunting, African policymakers, entrepreneurs, and private businesses have been working to mitigate unemployment among African youth in their respective countries by tapping into innovation. This panel will focus on the complexities of unemployment, expand on the roles of actors on the ground who are working to solve this problem, and give exposure to budding programs and innovations that have been successful in alleviating unemployment throughout the continent. 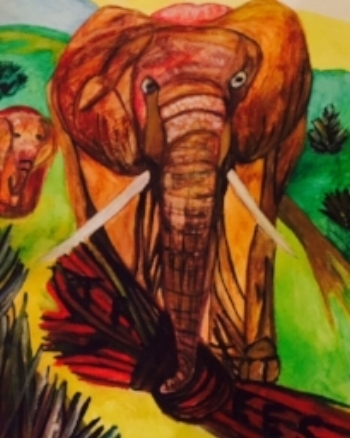 Special Event Feature: Elephant Art Shop: Original watercolor paintings, cards and prints for sale with proceeds to benefit the endangered African elephant species. We do hope that you will be able to join this important conversation. Reputation Dynamics Founder and President, Samantha Taylor, is proud to be nominated for and featured among a list of corporate responsibility services providers. Congratulations to the other nominees and look forward to advancing our important work in 2017. The Editors -- Our annual spotlight on the best of the best providers and practitioners in corporate responsibility. While strong leadership is an essential trait for executives in corporate responsibility, demonstrating this attribute while performing important tasks, practicing sustainable habits, contributing to the company’s bottom line, and driving others to perform exceptionally is worth acknowledgement. CR Magazine honors those who demonstrate a superior dedication to CR that is evident in every aspect of their daily lives. The CR Superstar is someone who lives and breathes sustainability and encourages everyone around them to participate in creating a better business environment. This is our annual list of outstanding CR thought leaders—successful individuals who were nominated by their industry peers, CR Magazine staff, and the Corporate Responsibility Association for their groundbreaking ideas, high-level thinking, and impressive leadership. We offer our congratulations for this year’s distinguished winners as we look forward to another year of industry advancement in 2017. Click here to view the complete list of this year’s superstars. Samantha Taylor is the founder of Reputation Dynamics, which connects and mobilizes corporations, NGOs, academics and influencers to address social, economic and environmental issues around the world. When she was 10 years old, Sam’s family moved to Kenya. Her passion for Africa, its people, and elephants, in particular, continues to inspire her work and commitment to bring the color and spirit of this vast, untamed continent. Partnerships are an increasingly important component of companies' corporate citizenship strategies. From purely philanthropic alliances to more complex, fully integrated collaborations, companies pursue a wide array of partnerships to achieve community involvement goals. Sound understanding and management of a complex set of issues will help to ensure that your partnerships have the ability to impact social issues and return value back to the business. Join us on July 13th to help you deliver on your programs' full potential. I am excited to be participating on a panel at Columbia University’s Annual African Economic Forum. My remarks on the Development Policy/RegionalIntegration in Africa panel will focus on ‘Aligning Business with Purpose', importance of partnerships to address community challenges and create a path to economic prosperity. Regional Integration as Development Policy: Throughout history, the African continent has been broken up and torn apart for the economic needs of outsiders. Now, as a group of nation states, the continent’s leaders are attempting to figure out how to establish partnerships to bring about inclusive growth. At a continental level, organizations such as the African Union, the African Development Bank and the UN Economic Commission on Africa are working towards creating an enabling environment for the citizens of various nations to engage in a range of economic and social activities. At a regional level, we have organizations such as ECOWAS, COMESA, and SADC working towards this aim. Our Regional Integration as Development Policy panelists will shed light on how this system of integration both creates lucrative opportunities for economic development, while also raising some major challenges. Please join us for our August Salon Series: The Uncondemned, featuring Samantha Taylor, Founder and President of Reputation Dynamics, a US-based corporate responsibility (CR) engagement, fundraising and international development services consultancy for non-profit, for-profit, and academic organizations. For and non-profit organizations are being forced to change the way they do business and focus on ‘Doing Good in Society’ in the face of disturbing world events, impact of climate change, and changing dynamics of philanthropic giving. Mere ‘checkbook’ philanthropy will no longer suffice, with 60 percent of corporate contributions now attributed to the donation of products, services, counsel and staff volunteering. Sam will provide perspectives about the role and critical need for inclusive partnerships to restore and protect communities, improve livelihoods and empower women as champions for change. On the heels of ‘The Uncondemned’ delegation to Rwanda and screening, Sam will also share her personal experiences about this journey and lessons to be learned from the increasing focus on the African continent. Sam founded Reputation Dynamics in 2005 to provide creative business and marketing solutions for executive management and their teams to protect and enhance the reputation of their brands, business, and community interests. Key sectors span health, poverty, environmental conservation and wildlife, women’s empowerment, education, and professional development. An early innovator and advocate of ‘Aligning Profits with Purpose,’ she advises a diverse range of organizations on long-term approaches for sustainability solutions, facilitating and building holistic partnerships to help improve the wellbeing of communities. Examples of initiatives include building a business council for InterAction, devising a marketing road map for The Nature Conservancy’s Africa practice, creating a strategic plan for the Agahozo-Shalom Youth Village in Rwanda, and corporate engagement for Rainforest Alliance and American Forests. Formerly, Sam was the Chief Marketing Officer of GMHC, the nation’s oldest non-profit HIV/AIDS care services provider where she spearheaded a once-in-27-year rebranding initiative. Prior agency posts included Managing Director at Bozell Worldwide and Director at Kreab Gavin Anderson. In 2002, Sam created the first ever corporate responsibility initiative for ACE Insurance in Bermuda in addition to managing initiatives for a variety of corporations such as GE Capital, Mercer, CIGNA, PricewaterhouseCoopers, The Chicago Board of Trade, CIT Group. Sam started her career at The Press Association in London. The most successful organizations now must be driven by purpose as much as by profit. They also recognize that increasingly social purpose is becoming a critical component in terms of motivating, recruiting and retaining talent. In this presentation, Sam Taylor, Founder and CEO of Reputation Dynamics, provides perspectives on how to align “Doing Good in Society” with business strategy, competitive edge and employee engagement. Sam Taylor's field trip to Rwanda in June of 2013 to visit and work with the late Anne Heyman who created a community youth village to provide formal and informal education for students impacted by the 1994 Rwandan Genocide. May her legacy continue and be replicated for vulnerable youth around the world. On March 8, the U.S. Chamber Business Civic Leadership Center and United Nations Office for Partnerships will celebrate International Women’s Day at the Ford Foundation headquarters. This annual forum brings together leaders committed to the economic empowerment of women. In 2013, this forum will expand upon 2012 and explore the influential role women play in the global business value chain. As more women formally enter into the economy, positive macroeconomic externalities include increased productivity for business, increased school attendance for civil society, and higher economic growth rates in host countries—externalities seen in Rwanda and China. However, woman and girls still face many challenges in attaining economic independence. This forum will highlight the influential role women play in the business sector and how companies and their partners are working to catalyze the economic empowerment of women in global markets. The Olympic Games: Will Rio Benefit as Much as Beijing? In partnership with Working Mother Media, Reputation Dynamics created an educational symposium – “Forum on Corporate Social Responsibility and Women: Next Generation Strategies for Change and Empowerment” – which convened more than 120 members from the corporate, nonprofit and academic sectors in facilitated round-table discussions and creation of solutions for challenges. The MDG Executive Sessions is a two-day forum providing an opportunity to network with young working professionals, UN representatives, and corporate leaders at the United Nations. Young Professionals from around the world will participate in panel discussions and case study think tanks about corporate social responsibility, social enterprise development, and capacity building strategies to realize the 8 United Nations Millennium Development Goals (MDGs). The Annual Youth Assembly at the United Nations demonstrates what committed, global youth leaders can and have accomplished in support of the MDGs. Corporate social responsibility (CSR), sustainability and ‘Going Green’ has emerged as a new management paradigm for safeguarding a company’s brand reputation, engaging employees, maintaining customers and driving revenue. Our leadership in the 21st century is increasingly being defined by innovative approaches that integrate sustainability and profitability. Sam Taylor, founder of Reputation Dynamics, will be joined by representatives from Royal Dutch Shell, General Mills and Unilever Bangladesh Limited who will discuss their Corporate Social Responsibility programs and how it is impacting women all around the world.